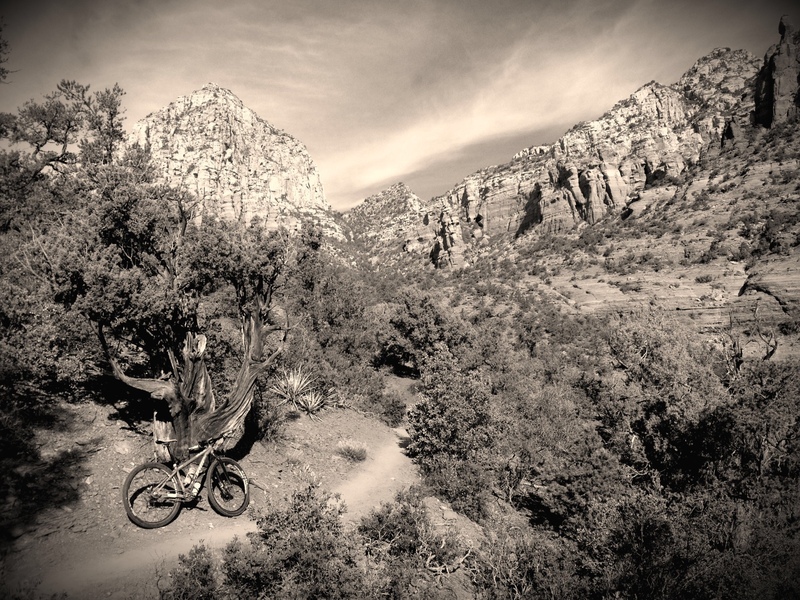 Anyhoo, the guys at the Arizona Endurance Series designed the SBFL a few years ago and have modified it each year, slowly improving it as new trails are open, etc. It’s offered up as a self-supported race each year. Unfortunately this year’s race was cancelled due to horrific weather on race weekend. I happened to be traveling through the week after the race was to take place, and had epic weather for riding. So I downloaded the GPX file from the AES website, and voila- I had a bible to one of the most epic one-day rides of my life. 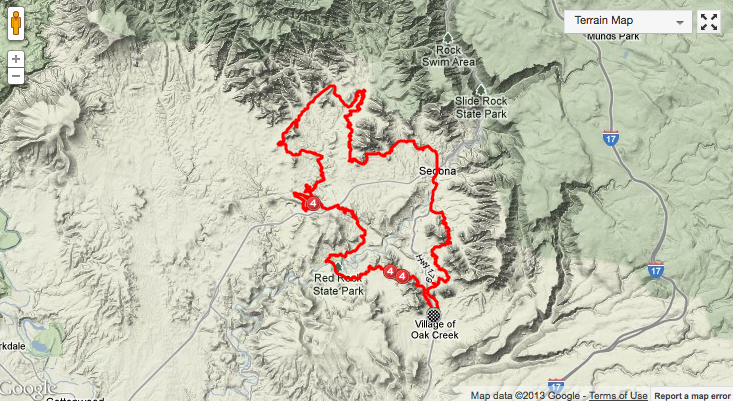 According to my garmin, the SBFL is approximately 55 miles with 6k of climbing. 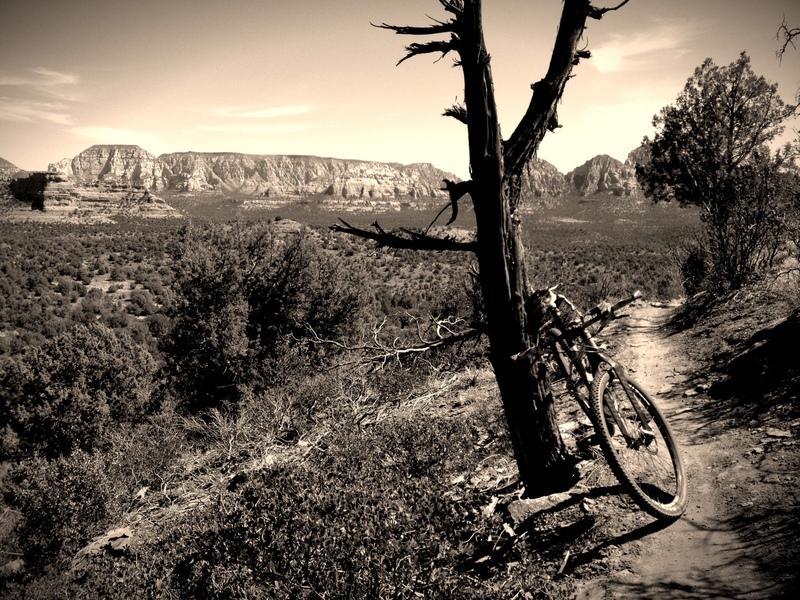 The climbing is mostly singletrack techy fun climbing – with just a little bit of road riding to combine different trail networks. I decided to ride counter-clockwise (the way the 2013 race was to be run) although I’m sure it’s just as fun clockwise (maybe next time :)). It starts and ends in the Village of Oak Creek (technically at the Bike and Bean), although I started a few hundred yards away at the motel I was staying at (The Wildflower Inn). 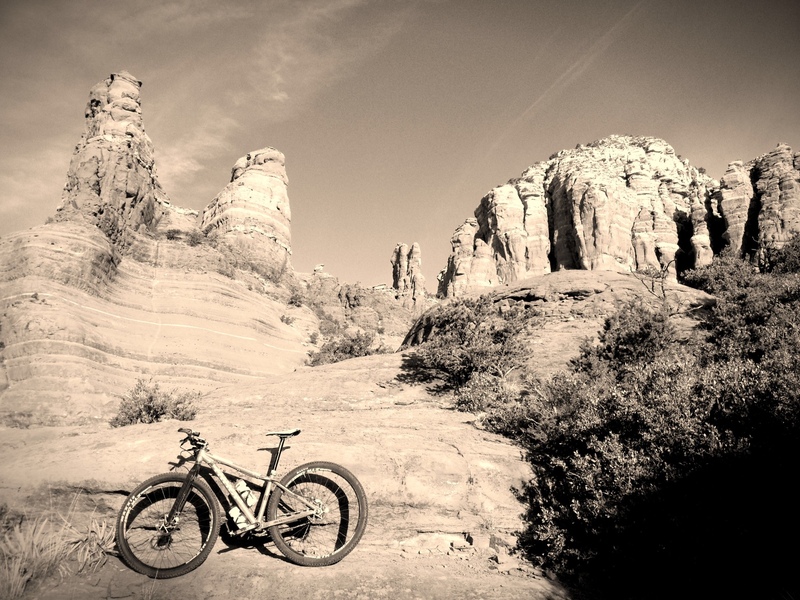 It’s such a crazy, epic ride with so many trail segments – that it’s too boring (and I’m too lazy) to discuss it all in detail. You’re better off just downloading the GPX and going and riding it yourself!! It’s worth it!! 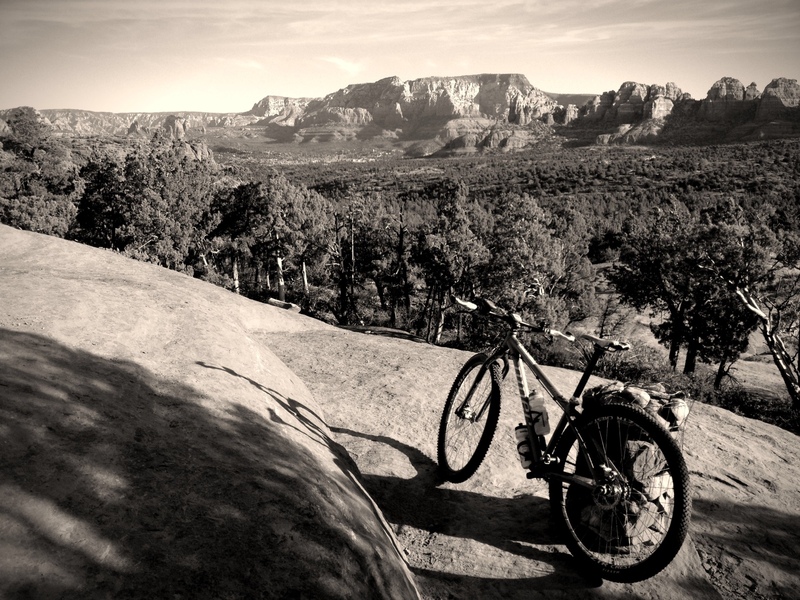 Amazing views around every turn, and a huge taste of the best Sedona has to offer. My personal highlight was the Aerie Trail. I’d never heard of it before, and was pretty fatigued when I made it to that section… pleasantly surprised by the flowy, fast trail. Sweet!! Aerie Trail – one of my favorites! 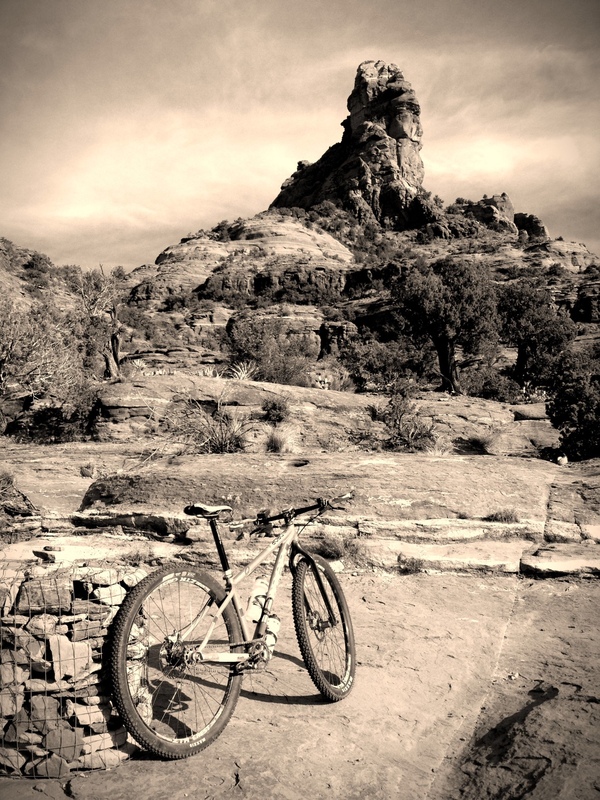 This entry was posted in Favorite Rides and tagged adventure ride, aes, arizona endurance series, big friggin loop, endurance race, mountain bike, mountain biking, sbfl, sedona. Bookmark the permalink. 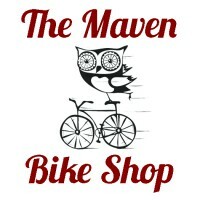 Re: Santa Fe BFL – 2X the elevation gain in 70 miles, half the oxygen = twice the fun.